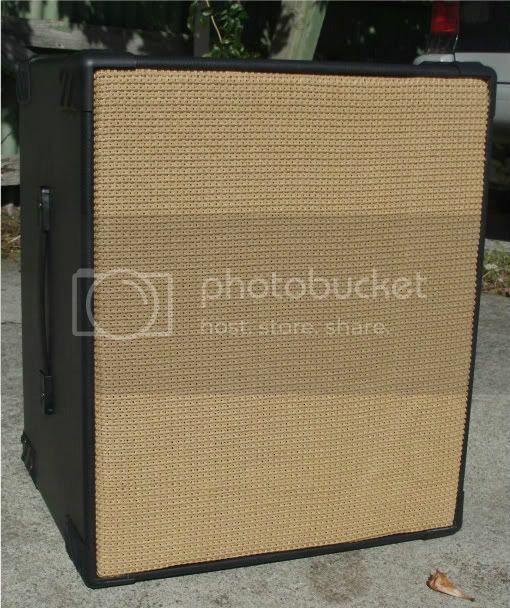 Re: A few days after work..
Yep got two Livesound cabs, the 8x10 has a metal grill and the 2x12 has cloth. No pics on me but I think it's the exact same stuff that Ampeg use, so Livesound can probably sell you some of that. timi wrote: Yep got two Livesound cabs, the 8x10 has a metal grill and the 2x12 has cloth. No pics on me but I think it's the exact same stuff that Ampeg use, so Livesound can probably sell you some of that. I might give them a call. But then again, the basket weave sounds interesting. How much do you have and what do you want for it? Enough to do an 8x10, you can have it for free. Do you still live in Wellington? let me know what suits you for picking it up? So I picked up the basket weave from Timi last night, Thanks so much Tim. I had a go at putting it on...so hard to do. I didn't do a very good job, but it is what it is. I think I could probably tidy it up a bit. Here is hoping I can get the next cab looking a bit better.